The world of sales has changed. In fact, it’s still changing. The classic model of sales managers harping on sales reps to always be closing is seriously out-of-date, and the olden days of salespeople always saying they’re busy but not getting much done should be a thing of the past. The modern sales manager is data-driven, using metrics and KPIs to understand how the business is doing and where the sales team needs help. Modern salespeople aim to educate and advise buyers, instead of persuading or tricking them into a sale. 1. Be the leader who pulls the rope. The sales leader plays a critical role. The best sales team in the world won’t perform well if it’s not led by a good leader. Think of Alec Baldwin from “Glengarry Glen Ross.” Got it? Ok, now don’t do any of those things. Building a foundation must start introspectively, by understanding what it takes to be a modern sales leader. To start: Don’t crack the whip. Pull the rope. Instead of constantly pushing your sales reps to close more deals, pick up the phone. Lead by example. Be a selling sales leader. Get on the floor and help your sales team reach quota. Hearing you on the phone will motivate your team to do the same, and they might even learn a thing or two by listening to your calls. 2. Bring the right people on the bus. 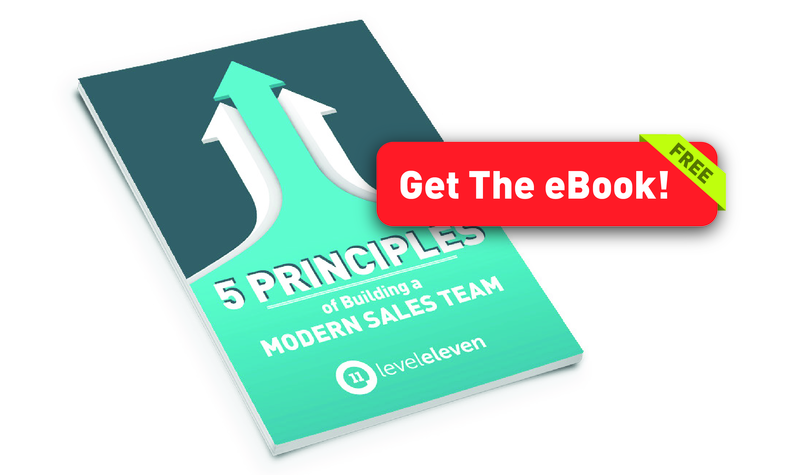 After you’ve put yourself in the mindset of being a modern sales leader, you need to build the ultimate modern sales team. But we know how difficult it is to hire good reps. And even if you find a good rep, it’s imperative to make sure they fit in with the reps you’ve already hired and the team you want to create. Focus on hiring reps with the right personality who can be trained and coached. You can’t change who a person is, but you can teach them to be a master salesperson (with the right coaching, of course). In short: Hire the smile, not the shark. And don’t forget about the importance of culture. Creating an energetic, team atmosphere with sales reps who are willing to ask questions and share what strategies work for them promotes collaboration. It turns your team into a group of allies working toward the same goal. 3. Establish and drive your sales process. Understanding your sales process is critical. What activities are your sales reps doing that moved contacts from one step of the sales process to the next? Talk to your sales reps and find out which activities they think define the sales process. Then take yourself through the entire lifecycle of a sale as a customer. Finally, use the information you’ve collected and identify which ones ultimately make up your sales funnel. When you understand your sales process, be sure to drive it with key performance indicators and motivation. he world of sales has changed. In fact, it’s still changing. Here's what you need to build the foundation for a modern sales team.